So many new bands ask to play The 8x10 and we can tell they think it is just a matter of putting them on any old show. Unfortunately, that is definitely not how it works. As much as we would like to be in a financial position to just book bands based on their desire or self-confidence, or even just on their talent...honestly, we aren’t, and we can't. We would love nothing more than to live in a world where people just came down to The 8x10 every night purely to hear new music, without preconceived expectations. Sadly, not the case. It used to be that way back in the day, but now The 8x10 is like a movie theater. People don't just walk in to see a movie they have never heard of, they go to movies that they already know about and want to see. Ok I get that. Fair enough. Where does that leave The 8x10 and our responsibility to the community to provide a place to gather and share music for beginners? And what about The 8x10's need to foster new acts and help them move from garages to clubs and hopefully from clubs to theaters? Well we developed a system for this that worked pretty well. We have made a few tweaks to it and are starting it up again. We think we have addressed most of the issues musicians had with the old program and hope this will be a better fit. THIS IS THE BEST WAY TO GET YOUR BAND ONTO THE STAGE AT THE 8x10 IF YOU ARE JUST STARTING OUT. The program is designed to dovetail each section into the next and the whole program works together, yet each portion stands alone as well. Artists should have a clear entry point, and a clear path to work their way up, building their fans along the way. 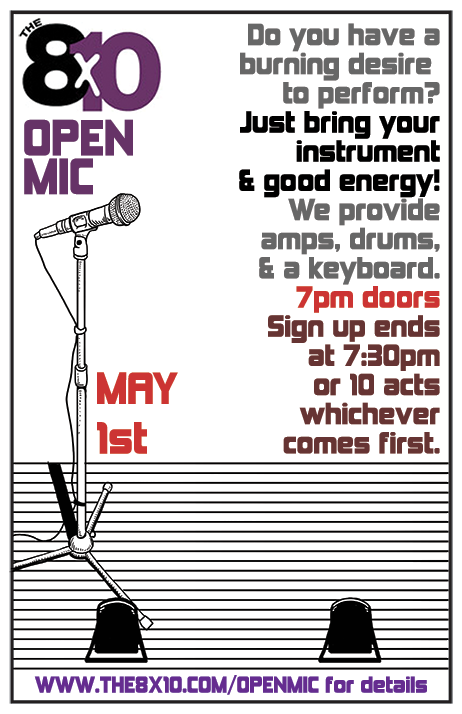 Open Mic is back! The first Tuesday night of every month will be the home of The 8x10 Open Mic night. We provide all the equipment, including amps, drums, and a keyboard. All you need to bring is your instrument and effect pedals. You WILL NOT be able to bring your own amplifiers in the building, no exceptions. Open Mic is for solo artists, bands, comedians, whatever. You can be playing for the first time or you can sell out the place with a surprise stop on your stadium tour. We can handle it. The only thing that is required is a supportive attitude. Not just for you but for all the acts that perform. Open Mic night is a great atmosphere when the people that come have open minds and give each act the respect they expect to be given when they themselves hit the stage. Sign up from 7pm to 7:30pm or when we have 10 acts whichever comes first. If no one signs up by 7:30 we close, so don't expect to arrive at 7:45 and sign up. Each act gets 3 songs or 15 min whichever comes first. 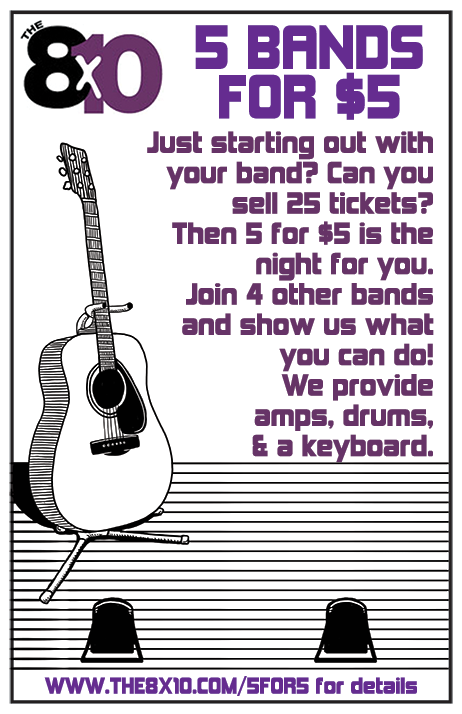 5 Bands for $5 is our way of providing new bands a chance to play The 8x10. It is designed for acts that are currently only drawing 25-50 people. There is no financial way The 8x10 can book a band that draws so few people, even as an opening act. So we built a night where we get 5 bands who can draw 25 people and suddenly the night becomes bookable. However, the night only works if each band brings the required 25 people. So as incentive, and to keep the bands honest, each band has to buy 25 tickets in advance and resell them. This is not pay to play. There is no "production cost" or "stage fee." Each band guarantees they can sell 25 tickets. If you can't sell 25 tickets you belong on Open Mic Night. Tickets are $5. The band gets $4 and The 8x10 gets $1. Bands come in, buy 25 tickets for $1 apiece, or $25 total, and then sell them to their fans for $5. The band makes $100 off those 25 tickets before they ever hit the stage. 5 bands paying $25 equals $125 guaranteed for The 8x10 which covers the cost of the sound and lights for the night. If the bands do that 125 people show up, the bar should ring enough to keep the night profitable and keep the program going. Quite simply, if you think this is pay to play (which it isn't) and you are against that, don't apply. If you can't sell 25 tickets, don't apply. Honestly, if you can't draw an audience of 25 people, you really shouldn't be on a high horse and making all these judgements about "the music industry" and "greedy club owners" etc, etc, etc. THE ONLY WAY WE CAN AFFORD TO TAKE A RISK ON YOUR BAND, IS YOU SHARE THE RISK. IF YOU AREN'T CONFIDENT ENOUGH THAT YOU CAN SELL 25 TIX, WHY SHOULD I BE? Now, I am sure some bands are still thinking this is some kind of scam, so we are going to pile on. What is the one thing worse than Pay-to-Play (which it's not)? BATTLE OF THE BANDS of course! We are taking the best parts of a Battle of the Bands and combining them with our 5 Bands for $5 program. Each night 2 bands will be selected to move on in the program. One band will be selected by bringing the most people. Plain and simple we can't do this without audience members in the venue buying drinks. However to balance that out, the other band will be selected by The 8x10 staff vote. This way the most talented band won't be shut out by the worst band just because the worst band brought 100 people. After 3 months, the 6 "winners" will play a separate show to determine 2 winners. After 3 more months, the second 6 "winners" will play a separate show to determine 2 winners. Two weeks later, those 4 bands get a show to determine the overall winner. There will be prizes for the winners at various levels like music store gift certificates, gift certificates to The 8x10, bar tabs, etc. The ultimate winner will be awarded an opening slot on a regular show here at The 8x10. So if you know you can get at least 25 people to come to your shows, 5 Bands for $5 is your entry point into The 8x10. The 8x10 provides our house drums and bass rig. We also have a Korg SV-1 keyboard. 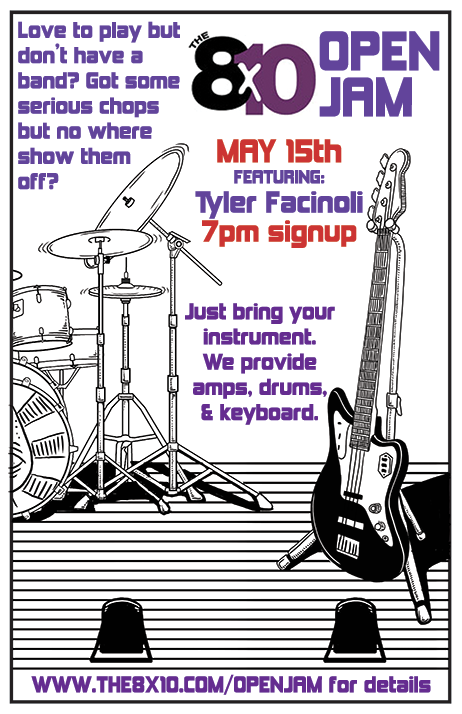 Bring your Kick Pedal, Snare, & Cymbals. And your amp if you absolutely can't play through our house Fender amp modeling amp. We suggest in the early rounds trying to bring as little as possible and in the later rounds bringing your rig. So you are a musician that has been around the block and been in a couple of bands, but are new to the area? Maybe you are just in between bands because stupid Gerald on bass had to "make a living" and "support his new baby" or some crap like that. Stupid Gerald. Anyway, you can play but you have no one to play with. Or maybe you are in a successful band but you want some outside influence to push your creative juices. Whatev. Open Jam Night is for you. Not really designed for bands as much for individual musicians, we have 5 "band" performance slots. Who is going to be in that band? it all depends on who shows up! Truly improvisational moments with a band made up of people who just met a half hour ago? Sounds like fun to me. We are lucky enough to have three stellar musicians as our house band on Keys, Bass, and Drums so if only 5 guitarists sign up, We can still rock the house. Just like Open Mic, we provide the backline gear. You only bring your instrument and effects. This really isn't meant for bands to come in and sign up for all the positions in one band slot, so much as it is about mixing things up and putting different people from different bands together with people that are not in bands. There is a Facebook group where you can interact with Ben and discuss upcoming nights. First thing first, go back and read that. Seriously. This is not the way to start your relationhip with The 8x10, by skipping over what we are trying to tell you. But.....here is the condensed version. This is honest advice from over a dozen years in the business. If you are a new band, with no known verifiable audience draw and no history of playing the Baltimore market....be honest about it. Honestly figure out where you fit in this program and work WITH us to make the program work. If you come into any venue with a bad attitude or diva personality and you are only bringing in 20 people....that just won't fly. Save that stuff for when you are selling out the place. Every venue has its own system to build bands. This just happens to be ours. Whatever the venue, whatever the system...don't come in throwing shade. It is the quickest way to not get booked. TICKET SALES MATTER. HUSTLE TICKETS. If you think you are above selling tickets, why are you playing live? Just be a studio band. We have a long list of bands that started out in our open mic night or our 5 for $5 program that have gone on to become headliners at The 8x10 and a few bands that have exploded like Pigeons Playing Ping Pong, so don't think this is below you. The 8x10 wants to build your band. We want to have you play here every 3 months and grow your audience. It is what keeps us open and rocking! It is in our best interest to do right by your band so you can grow and build a loyal 8x10 following.